How sweet! 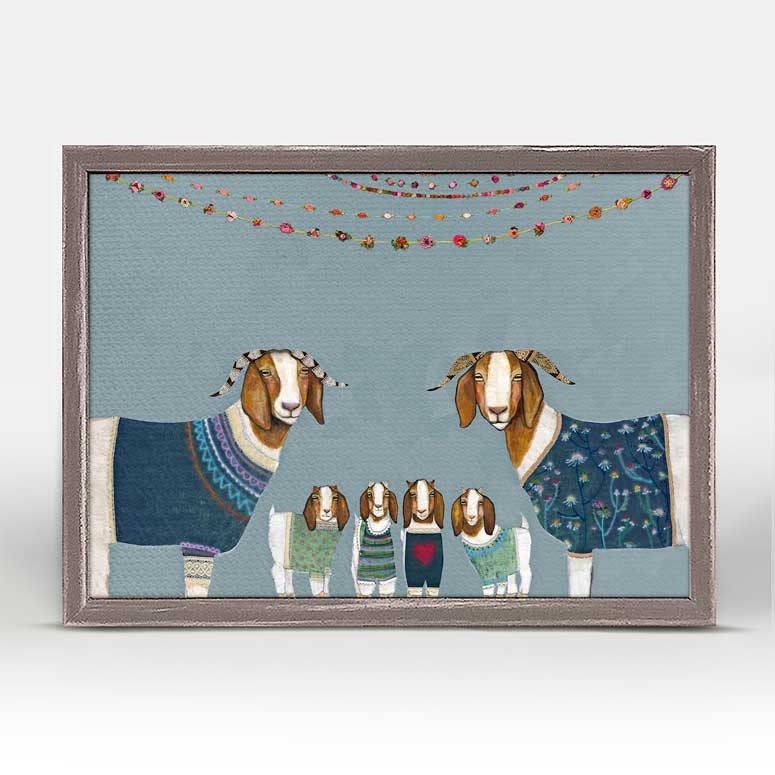 This loving family of goats is delightfully decked out and ready for any party. Good things come in small packages! And in this case it's our new mini framed canvas art. Get creative by bringing a series of small things together. These mini masterpieces come ready to set on a shelf or hang on a wall. The frames are approximately 1.25" in depth and come with a lightly distressed rustic finish that creates a beautiful texture. Please note that frame color is predetermined for each design and the frame finishes may vary due to the intentional rustic finish.Majestic and colorful, this king of the jungle will reign supreme over any space you hang him. Artist Eli Halpin's colorful brush strokes energize this artwork and your environment. Our canvas art is reproduced in our San Diego studios using the best digital reproduction method currently available, resulting in great clarity and color saturation. Canvases are exceptionally durable and can be cleaned with a soft, dry or slightly damp cloth. “Eli Halpin grew up in Alaska and now lives and paints full time in Austin Texas. Her focus is on animal face expressions while enjoying and celebrating their paws, cheeks, whiskers, claws, hooves, antlers, horns and tusks.